When hospitals and medical facilities are struck by disasters, staff , patients and wider societal resilience all suffer, writes Steve Peak. This is where mobile healthcare facilities come into their own – especially during the recovery phase. Losing access to local medical and health services can have a detrimental effect on communities, so a swift response is crucial in continuing to deliver critical quality clinical care, after a crisis. First response teams can set up shelters and triage in the immediate aftermath of a disaster using tented and other rapidly deployable solutions. However, these are not a long-term solution and restoring healthcare facilities to disaster-struck communities is a top priority. This is when mobile healthcare facilities come into their own. 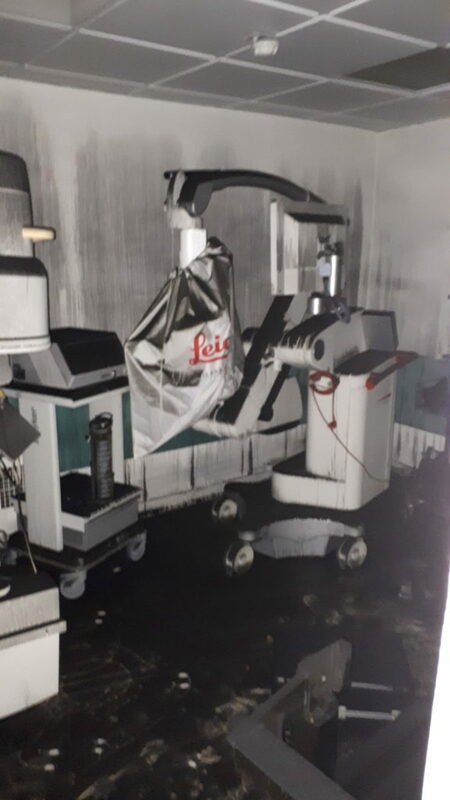 When the Centre Hôpital Universitaire Point-a-Pitre (CHU) in Guadeloupe experienced a catastrophic fire on November 21, 2017, its patient community was left without access to surgical services or a functioning emergency and trauma department. Guadeloupe, a French overseas territory, is home to around 450,000 people and the 881-bed hospital is one of the major acute service providers in the region. It carries out approximately 60 per cent of care activity in the archipelago and is one of the few hospitals in the region to provide life-critical surgeries. Eleven operating rooms were directly affected, as well as an endoscopy suite. Extensive renovation of the theatre flooring was required, and services were suspended. Hospitals are susceptible to wide-ranging smoke damage. If their ventilation systems are compromised and shut down, air quality can no longer be maintained, and mould, bacteria and viral spores can develop in the air ducts. Thorough cleaning is needed, in addition to lengthy repairs, and all air systems must be revalidated. Equipment can be expensive to replace and cannot always be sourced at short notice. As an environment that provides care to patients whose immunity is compromised, all damaged areas must be cleaned, made sterile and tested extensively before they can be reopened to surgical procedures. This process, particularly when multiple operating rooms are damaged, can be complex and time consuming. In Guadeloupe, other hospitals and clinics in the area opened their doors to its patients. However, this was unsustainable in the longer term and was not ideal for patients having to travel long distances. In the immediate aftermath of the fire, a field hospital of military-style tents was deployed to provide interim care, but this was not a resilient enough solution for some of the more critical surgeries. However, the concerted local response did allow the CHU time to assess the damage and extent of repairs needed. Renovations to structural aspects and the ventilation ducts would take several months, possibly as long as a year. The French Government called in specialists to provide an answer to the sudden gap inpatient care. The solution brought together technical advances from across Europe – mobile healthcare facilities from UK company Q-bital Healthcare Solutions, architectural planning and enabling works from Dutch specialists Young Medical, medical gas installation and commissioning from Meditechnik, and specialist ventilation systems from Modderkolk in the Netherlands. significant and the estimated recovery period lengthy, Q-bital provides a bespoke design service to devise a robust multi-modal healthcare complex, including consultation rooms, clinic areas, operating theatres, staff welfare zones, decontamination facilities and an equipment library. Representatives from the companies were on-site in Guadeloupe within days of the fire and consulted with the hospital’s clinical team, unions, and the island’s health ministry. Together, this multinational team designed a temporary surgical complex. There were many challenges, the first of these being environmental. Guadeloupe is an archipelago in the Caribbean, a tropical climate area. Not only does it experience high humidity year-round, but is subject to a lengthy rainy season and is at risk of hurricanes. To develop a temporary building complex robust enough to maintain service through these variable conditions, special air handling systems were installed to pre-cool the air before it enters the operating theatres’ ventilation systems. These systems chilled the air to approximately 14°C, which dehumidified it, before passing it into the operating theatre facility. Once within the theatres’ ventilation system, the air was brought back up to 16°C and humidified to provide the optimum conditions for surgery. This two-stage system ensured that the theatres’ air handling systems were not overloaded, providing staff and patients with a comfortable, compliant environment. The CHU is near the top of a hill, and the space chosen to hold the complex was not on level ground. The land was levelled off and hard standing was laid, but the problem of weatherproofing remained. Together with a local contractor, the companies designed a concrete structure with elevated plinths, interconnected by concrete beams to create one cohesive foundation. The mobile units were lowered and then secured onto the plinths, ensuring that the feet of the facility remained dry. The total weight of the complex was judged sufficient to protect it from being lifted by hurricane winds, and the entire complex would move as a whole in the event of earth tremors, reducing the risk of damage. Other technical challenges arose from regulatory concerns. As the facility was going to provide emergency and trauma care, the operating rooms had to provide suitable clinical environments for this infection-sensitive surgery. Mobile operating theatres with laminar flow ventilation were dispatched from the UK. In addition, a post-operative recovery ward with HEPA air filtration was deployed, as well as a unit to provide staff with a changing area, welfare zone and administrative area. Close liaison with the hospital’s teams ensured that local standards, such as fire safety, electrical safety and water testing, were met. One of the greatest challenges was introducing medical gas into the theatre complex. Mobile facilities are usually served by cylinders through integral medical gas banks, but in this case the projected duration of the project and logistics made it more appropriate to pipe medical gases in from the hospital’s own supply. A pipeline from the hospital into the operating theatres in the complex was developed; modifications to the mobile facilities ensured compatibility. The operating theatre complex was ready for use within three months of being accepted as a solution. Emergency surgical patients can now be treated more rapidly, as they no longer have to be transported to alternative sites further away, and patient access to surgical services is partially restored at the CHU. Beyond this project, this innovative response has potential application across the world, whether as part of a contingency plan or in disaster response. For remote areas, or those with topographical challenges, this collaboration can facilitate the provision of surgical services without the lengthy and costly development of new, traditional infrastructure. Towns and cities with restricted access are also often serviced by one hospital, meaning that it is difficult for that facility to undergo refurbishments, as patient care must be suspended for the works to take place. 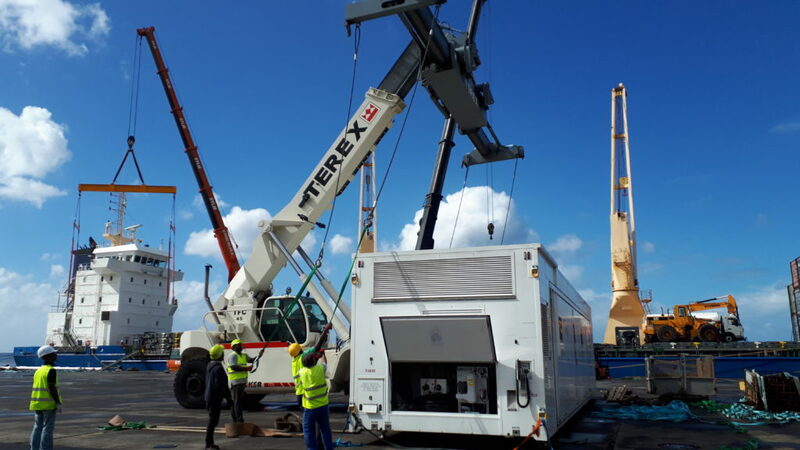 Bonaire, a Caribbean island, utilised a similar temporary Q-bital solution during the refurbishment of its only hospital, ensuring ongoing access to services while modernising the hospital’s facilities. Q-bital mobile facilities provide additional capacity to help alleviate a bottleneck in patient flow, whether through increased demand for elective procedures or through lack of bed space availability. This improved patient flow can free up hospital resources through an increase in efficiency, helping to maintain treatment targets and to release pressure on internal hospital systems.